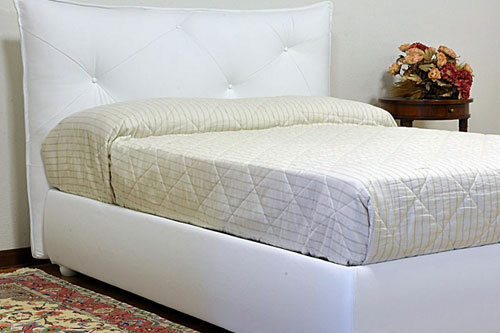 The contemporary beds are available in many different models both in single and double sizes, as well as in intermediate sizes, such as the Queen-size beds and the French beds. Then, there are many available models: some of them are characterised by a very flexible matching skills, others by a simple and elegant design, many others by their originality and prove to be very eye-catching and attractive beds. The VAMA Divani contemporary beds, all linked by internal structures characterised by impeccable strength, are made with the proverbial craftsmanship that distinguishes our Italian artisans, and they can be chosen in many different materials, from leather to fabric. Moreover, among these contemporary beds, there are models with "storage box", such as the sommier beds: this is a convenient solution for those who want to optimise space with the best level of convenience. You can order the mattresses to match with your contemporary bed directly on this e-commerce store, choosing, also in this case, from a wide range of products. Leather bed characterised by a very modern and original style, a large and buttoned headboard embellished by decorative buttons with random application. Made in fine grain leather in grey colour, the Duty bed can be even realised by VAMA Divani in different sizes and custom models. Fabric Sommier Double bed characterised by a simple and versatile style, which can be successfully placed in any kind of bedroom that, equipped with storage box, allows you to really save a lot of space. This fabric bed can be customised in many different ways, according to your tastes in terms of colours, sizes, types of feet, and it is also available without storage box. There are many sizes available for Sommier beds, and the Queen-size bed is an intermediate size between the French size and the single one. The bed we present in this page is the Queen-size bed without headboard equipped with a 120 cm wide mattress supported by an orthopaedic slatted base made of beechwood. Single Sommier bed equipped with large storage box in which you can store objects of any type, even very bulky ones, thus ensuring a significant space saving in your house. Excellent solution for those who want to make the best use of space, the Guest bed is a pretty and comfortable fabric Sommier bed which contains an additional slatted base inside, which can be pulled out, just like a drawer. The second bed can be used either as an additional single bed or next to the main mattress, in order to obtain a real double bed. Characterised by an essential and elegant style, it proves to be a very perfect piece of furniture. Fabric double bed characterised by a simple and linear style, with a wide headboard featuring a lightly curved shape on its top. With a removable cover, the fabric of the Giulia bed can be safely cleaned in your washing machine, just as it was a garment. This bed can be combined with great ease and it is perfect for smaller bedrooms, you can order it in any size or customise it in any detail and without storgae box. Feel free to contact us for a custom quote. Fabric double bed characterised by a very original headboard, realised with two large and fluffy cushions adorned with side ties. A model which presents a simple and modern design, very easy to match and with fully removable cover, which can also be customised in any size and feature. The model shown in the picture is with storage box and upholstered in fabric, but you can customise it with details and features you want or prefer. 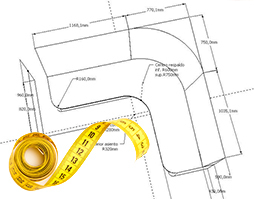 Feel free to contact us for a custom quote. Fabric double bed characterised by a simple and clean design, a real "joker" which can be combined in a very easy way to different contexts, both classic and modern ones. Compact model, made of high quality materials, with completely removable cover, it may be required without storage box, as well as custom bed or in any size. Feel free to contact us for any different change. Fabric single bed characterised by an original and modern design, equipped with two headboards, a classic one and a side one, like a chaise lounge. It comes with a completely removable cover, therefore, it is easy to clean. The Thom bed is equipped with storage box allowing you to optimise space in a very practical and efficient way. 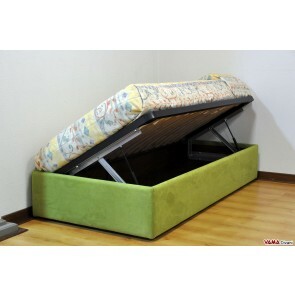 It can be customised in any size, such as a double or a queen-size bed. For any change or custom quote, feel free to contact us. Contemporary and stylish leather bed, featuring a large headboard characterised by a charming geometry that provides a beautiful and elegant look. The same model can be customised in many different ways. The Eva bed is also available with storage box or in the French size, and it is suitable for many different combinations. French bed with storage box, upholstered in fabric with removable cover. It can be customised in many colours or materials such as faux leather, leather or microfibre. As for all our storage beds, even for the French bed, you can choose the best lifting movement option. For its feet, you can choose among many types of wooden, steel feet and wheels. It can be realised even in any custom size.